Just a few photos from our annual trip to Provincetown. 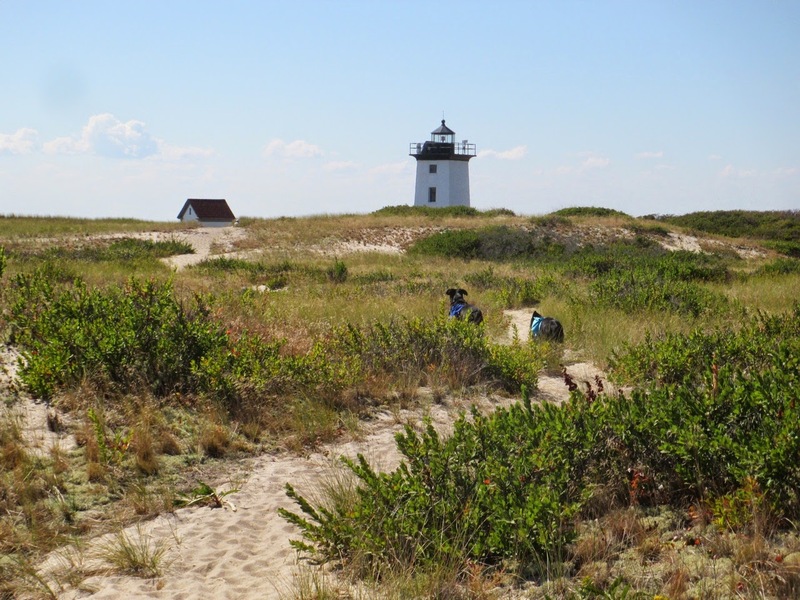 As much as we are in awe with the natural beauty all around this country and places we've been in Europe, we never tire of the scenery we have here in New England at the Province Lands National Seashore. The sky and sand and sea and marshes are spectacular. The weather was very cool for this time of year so the crowds were much smaller than usual. Yikes! I'm Gaining All That Weight Back! We always meet great people at the campground. Some have become once-a-year friends including Linda and Sherri who arrive at camp before we do and leave a week before we do. They always have flowers in their trailer and each year they give us the flowers when they leave. It's become a very sweet tradition, don't you think? We also met some new people this year - Frank and Elsie - both retired Army nurses who now live in Florida. They have a yellow lab who Benni really got along well with. They've lived all over the country and in in many foreign countries as well. I would not peg them as ultra conservative or anti-gay; in fact they seemed very liberal and gay friendly, but, surprisingly had no knowledge of the significance of the rainbow flag. We explained. 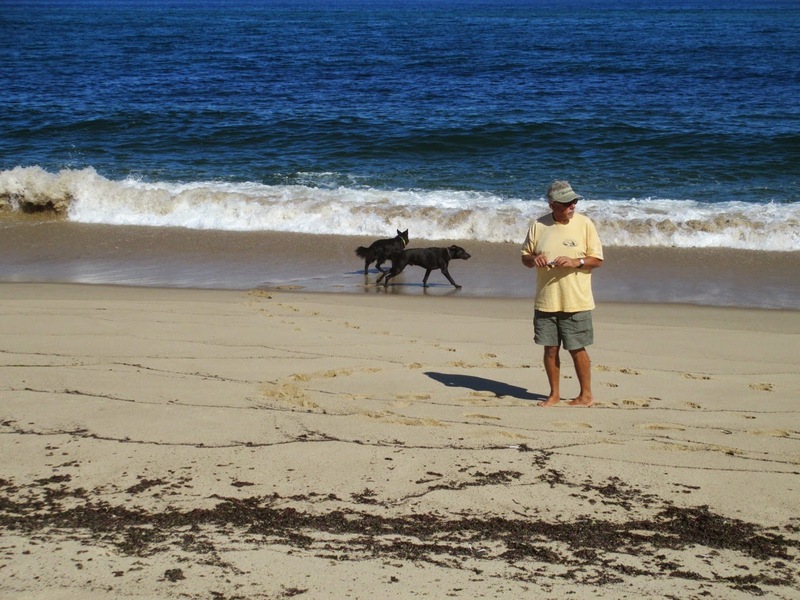 This year, our friend Dottie and her dog (our dog Benni's best friend) joined us for a few days. The Hindu was finally back in Ptown after a long absence but minus Captain Kevin Foley whose many stories were always the most entertaining part of the sailing experience. Funny, I have not included any photos of the town of Provincetown. Not much has changed there except for more refurbishments, fresh paint, manicured gardens, and upscale shopping. I've lamented the gentrification or should I say "snobification" of Ptown before, but this year it seems to be way over the top. And the privileged are flaunting it with a air of normalcy that betrays their ignorance of how most of us live. And what is sad, is that there are so many people who would consider Leon and I privileged. I guess in many respects we are. Still, in Ptown ordinary folks like us are being excluded from most venues (guest houses, hotels, nightclubs, restaurants, retail stores, by virtue of our limited finances. Ptown used to have something for everyone - restaurants, t-shirts, bars, shows - but now conspicuous wealth and in-your-face greed seem to be the norm. Like the airlines, Ptown businesses and the town government are charging more for every little thing - pet charges, parking, food, ice cream, cocktails, etc. The Car Club had extravagant charges to advertise and rent space for their annual car show, and like many people and events, may not return next year. We were able to find a few earlybird specials which, because meeting friends required us to eat out a few times, were very reasonable. A grocery store roasted chicken provided us both dinner and lunch the following day for $9 ($4 more than the grocery store back home, however). We did take in one show, Miss Richfield, a silly drag comedian, which was OK. I had a cocktail and Leon had a diet Coke at the show and we were blown away when the waiter announced it would be $17 when he delivered our drinks. And we got gelato "buy-one-get-one free" on the closing day of the the gelato store. Otherwise we mostly went to the beach, hiked out the breakwater and ate and had beer or cocktails at the campground. 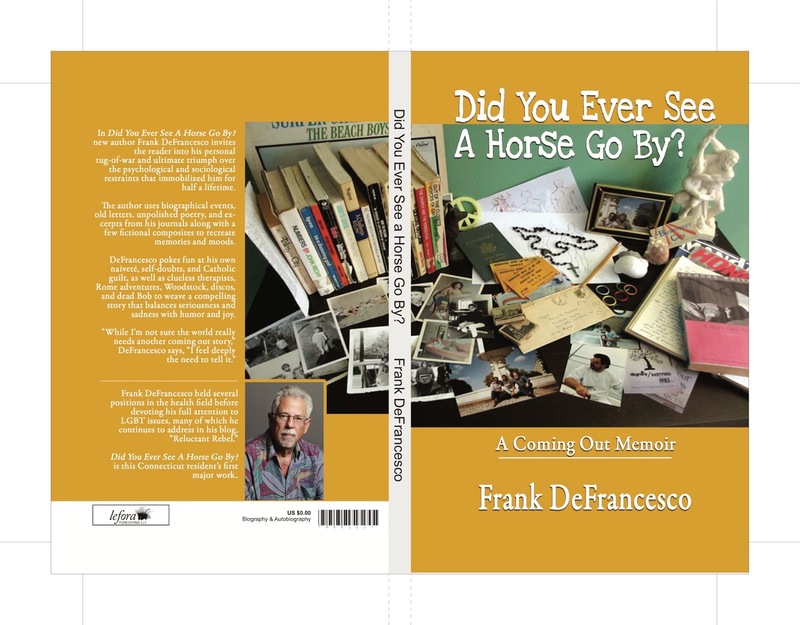 Update On The Book - "Did You Ever See A Horse Go By?" Well, the PRINT version of "Did You Ever See A Horse Go By?" is available in a paperback format from Amazon. I'm really proud of my sis (Sister "Dee" is on the far left of the photo) for going out and marching for the environment. It is one of the issues that the Sisters of Mercy of the Americas care deeply about and they are out there. They are not a young bunch, but very young at heart and they don't sit around much as you can see. Given that the book turned out to be only about 200 pages, I just want to say that I did not set the price for the book - that was set by the publisher. I know it may be a little steep for some of you guys (it certainly would be for me). Sorry about that. I'm told it will be on Amazon fairly soon. Before long there will be used copies available for twenty-five cents, no doubt. Anyhow, I am lousy at self-promotion, but if any of you read the book and like it, don't pass it on - tell your friends to buy their own copy! I haven't even got a copy yet - I think I get 5 copies as a courtesy from the publisher. Thanks to all of you for reading this blog and for all your support. P.S. THERE WILL BE A BOOK SIGNING AT THE BRISTOL PUBLIC LIBRARY ON OCTOBER 30TH at about 7:00 PM. We just got back from P-town after two weeks of fun, sun, surf, sand, and sticker shock, (more on that later) only to finally read and follow-up on some email. My colleague and a member of Lefora Publishing let me know I now had an ISBN and sent me a link to Amazon. I'm thrilled to say I'm now available on Amazon in Kindle form. Now this is both scary and exciting: scary because I'm finally out there in a way that is very different from the blogosphere. Scary because being out there means being open to criticism from a possibly wider audience. People whose opinions may be not so nice. Oh, well! I think I'm ready for it. And exciting - well, because it's pretty damn exciting to be published - and by a publisher who thinks me worthy of print. From what I can ascertain, the print version of the "book" is not yet available. is difficult to blog or read blogs with just my iPhone. We don't get good phone reception at the campground and no wifi at all. Cannot easily post photos. So until I get connected, ciao. I've just been informed by my publisher, Lefora Publications that my memoir will be published sometime in October. Just a few more rocks to go and some touch-up spots where there are gaps. We ran out of concrete ( after using 720 POUNDS of the stuff), so stopped and cleaned up the work area, then went out for a late lunch/early dinner at the Chowder Pot with Ed and Jeff. I still have a few ideas...maybe embedding my old cell phone and an antique cassette player...some flatware and a few dishes...putting Mary on a half-shell on the very corner...or a building a grotto reminiscent of Lourdes complete with a fountain of holy water...Right now though, I'm sure delirium has set in and I'm dead tired.